More than two thirds of car dealers in the UK are worried about the possibility of selling on a 'clocked' car, according to HPI. The automotive technology solutions provider has revealed that as many as one in every 20 cars it checks has a discrepant mileage. It is unsurprising, therefore, that 70 per cent of dealers are concerned their reputation could be damaged by them unknowingly selling on a car that has had its odometer tampered with. Most car dealers recognise that ensuring the safety of their customers is of paramount importance. That is why many use their road risks insurance policy to get behind the wheel of the cars they are selling and double check that they are in a safe, roadworthy condition for a potential buyer. Indeed, exposing customers to risk was dealers' main concern when it came to selling clocked cars. Surprisingly, dealers were less concerned about the threat of a judicial sentence, despite the fact that selling a clocked car is a criminal offence as it involves providing a ‘false trade description’ for a vehicle. 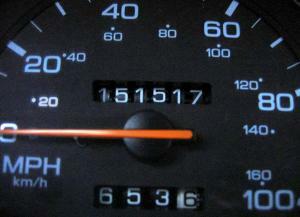 Even if they have not clocked the car themselves, selling a vehicle with an altered odometer could still land a dealer in trouble. The HPI advised that all motor traders should conduct thorough checks of their stock's history to make sure there are no discrepancies at some point in the past. Neil Hodson, managing director for HPI, said: "A sound mileage verification strategy, which is backed by a thorough investigations process is not only best practice, but can provide dealers with a sound legal defence. "Anything less leaves dealerships, their customers and their reputation, at the mercy of clockers."